A police dispatcher is suing Cairo, alleging unpaid wages and violations of workers compensation acts. 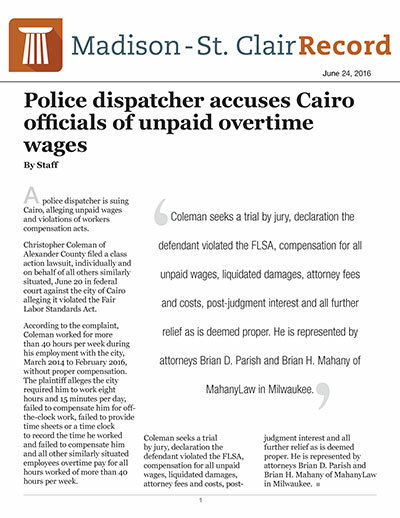 Christopher Coleman of Alexander County filed a class action lawsuit, individually and on behalf of all others similarly situated, June 20 in federal court against the city of Cairo alleging it violated the Fair Labor Standards Act. According to the complaint, Coleman worked for more than 40 hours per week during his employment with the city, March 2014 to February 2016, without proper compensation. The plaintiff alleges the city required him to work eight hours and 15 minutes per day, failed to compensate him for off-the-clock work, failed to provide time sheets or a time clock to record the time he worked and failed to compensate him and all other similarly situated employees overtime pay for all hours worked of more than 40 hours per week. Coleman seeks a trial by jury, declaration the defendant violated the FLSA, compensation for all unpaid wages, liquidated damages, attorney fees and costs, post-judgment interest and all further relief as is deemed proper. He is represented by attorneys Brian D. Parish and Brian H. Mahany of MahanyLaw in Milwaukee.